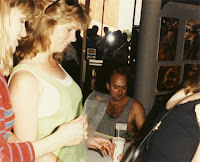 In a real testament to the idea that "You can buy anything on eBay," I recently acquired some photographs out of of someone's personal collection. The idea of buying someone's personal photos is a bit creepy, but these seemed interesting enough for me to get past that. And I'm glad I did, because in addition to being a truly fantastic blast from the past, there are some really interesting details hidden in the background. 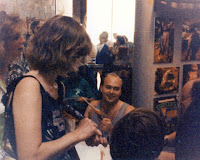 These pictures appear to be date stamped August 12, 1989 - nearly 20 years ago! 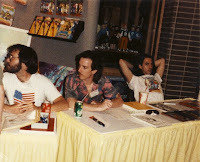 These first two pictures are pretty similar and feature Steve Lavigne behind the table. 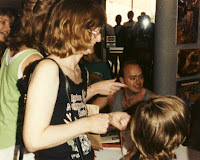 I think you can also see a piece of Peter Laird's head in the first picture. 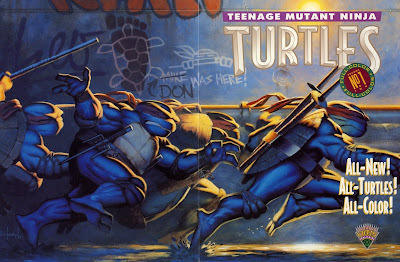 What is really great though is in the background there appears to be pictures of the Turtles and Splinter costumes for the then-upcoming movie. The movie filmed in September 1989, so this was even before then! 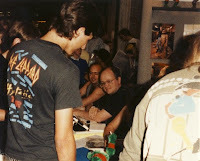 Here we have one more picture of Steve Lavigne, then a shot farther down the line looking back at both Steve and Peter. In the second photo you can get a slightly better look at one of the photos on the wall. 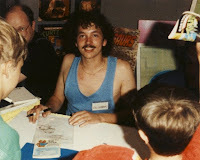 And here we have a better look at Peter, and finally Kevin Eastman as well. Now we can see a few more pictures on the back wall as well as some comic book covers (and cereal boxes!). 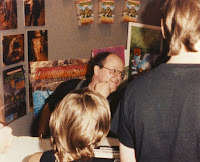 Last, but far from least, we see the end of the autograph line with Jim Lawson, Michael Dooney, and Steve Murphy. 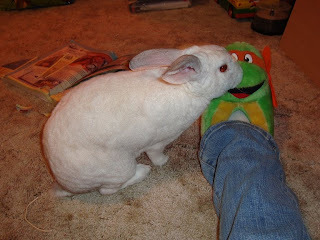 One cold December 26th, about 10 or so years ago, I was wandering through a mall where I found a pair of fuzzy Michaelangelo slippers very out of place on a shelf in one of the department stores. 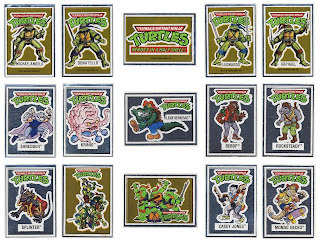 I'm pretty sure they were a return and I doubt they were purchased that same year (TMNT stuff had very much disappeared from stores by this time). But no matter, they looked to be in new condition and it being the day after Christmas they were dirt cheap. With a cold winter chill finally hitting California today, it seemed a good time to break them out. ..back in the day ( some day ..A day long ago ) ..Mikey's dad ran a vending machine operating company, even Mike himself was involved and working for the little operation at one point. I also remember something about a unicorn and a bass playing dinosaur..anyways- - . When he was a kid, his dad got in some surplus of extra kids' vending prizes. A big trash bag filled with stickers and vending card inserts of his favourite heroes. 12 million years ago, as a gift .. Mikey gave me a small bundle of stickers and this insert ( goes in the front of the machine to show the kids what they are getting for their hard earned quarter or 1/2 dollar nowadays ;/ ) ..i coulda sworn these cards actually had a technical name, but i just can't remember. The card here shows 12 of the designs of 15 stickers. 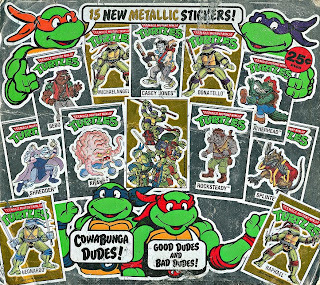 The designs not shown on the insert are Mondo Gecko, a classic group shot from Ryan Brown's style guide of the time, and the 1988 TMNT Logo and it sez ' Heroes in a Half Shell ' respectively. I'm not positive .. but i think there are silver and gold versions of each sticker. Unless my mind is playing tricks on me like it normally does, that would mean their are 30 stickers to this collection including the variants. Don't hold me to this tho'.. i'll have to double check my dwindled collection cuz i used a number of them over the years since he gave 'em to me and i don't even know if i have at least a full set of 15 anymore. I think i do tho'. Miguel's like family to me, so actually ..this was a weird but cool & special gift. I don't think it's the case that each one was made with both a gold and silver background, but I can't be certain about that. I do know that I really love these things! 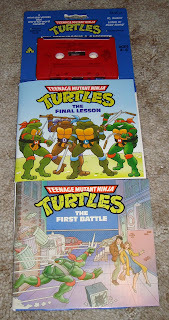 For a most awesome and complete collection of TMNT images and other cool stuff, be sure to visit tOkKa's Flickr stream! 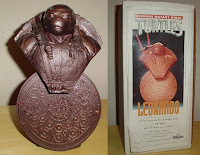 Awhile ago I shared with you the bronze version of A.C. Farley's Leonardo bust. 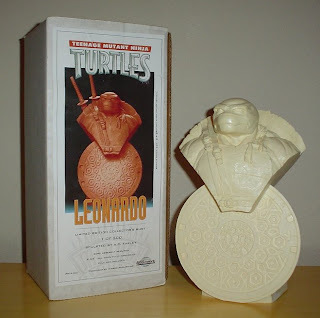 At the same time I mentioned that there was an unpainted version. I couldn't show it to you then because I didn't have it. Well, now I do, so here it is. In honor of the recently revealed "Music Don" action figure showcased at The 5th Turtle, here's a look at how a "Music Turtle" was interpreted by someone who actually knows something about Ninja Turtles, the fantabulous Ryan Brown. T-shirt, guitar, and no crazy chap pants - What a concept! Don't miss Playmates' defense for "Music Don", posted today by Murphy. Thanks for all the love, Playmates. We're sending it right back atcha. On the heel of today's big announcement, how about a moment of reflection on the days that were. 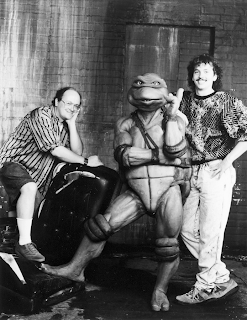 Above is a press photo from the first Teenage Mutant Ninja Turtles movie with Peter Laird and Kevin Eastman on the set with Leonardo. Back when two men were able to work and collaborate together to create characters and stories that inspired and brought joy to millions of people around the world. I can accept that business partnerships come and go, just as friendships do. But today's press release seems to be dripping with insincerity as far as Kevin and Peter's appreciation for each other goes. Kevin's sale of the TMNT to Peter shouldn't exclude him from being a creative mind that can occasionally be tapped for the purpose of good storytelling, but because the two of them are apparently unable to speak directly to each other, that's exactly what it does mean. I can only hope that they'll be able to put aside they're differences just enough so that whatever participation Kevin has in next year's 25th anniversary events, there can be some sincerity showcased between these two creators. As it stands now, it seems they go as far as avoiding each other when they're at the same convention. 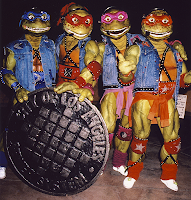 If the TMNT are ever going to get the respect they deserve from the world at large, there needs to be some reconciliation. There is no shame or lost pride in reconciliation; it's a standard show of being an adult. 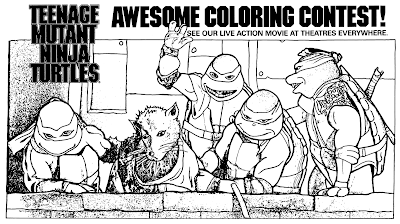 To close out 2007, here's the TMNT newspaper comic strip from December 30, 1990. 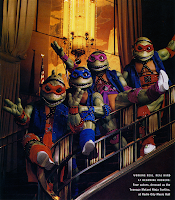 The live-action, direct-to-video "We Wish You a Turtle Christmas" hit stores in 1994 at the same time as its counterpart, "Turtle Tunes." 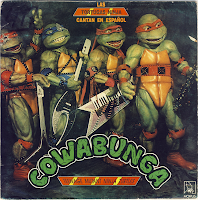 Each video is 30 minutes long and features the Turtles and sometimes Splinter and sometimes these random kids (who apparently know the Turtles quite well) singing songs that never had a chance for a Grammy. Pictured to the top left is the cover to a Netherlands release that combines both videos onto a single DVD. Although I'm not exactly positive that this is an official DVD release (you can see the whole DVD cover here and judge for yourself). To the bottom left is the cover to a promotional cassette soundtrack that was released to advertise the original VHS tapes (full cover insert here). 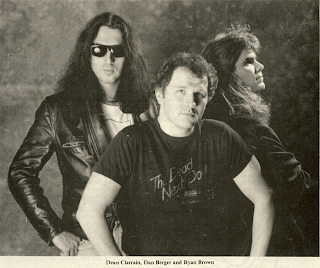 The cassette features all of the songs from both videos, although some songs are missing dialog that leaves them with awkward chunks of instrumental. One of the songs actually runs longer than it did on the video. Merry Christmas to everyone who is celebrating today and tomorrow! 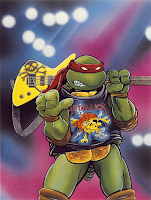 This is a promotional trading card from TMNT-branded frozen pizzas from McCain Elio's Foods sometime around the release of the first TMNT movie in 1990. 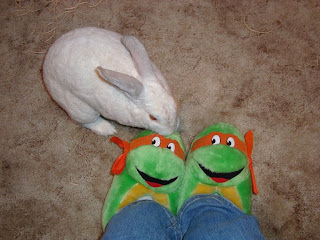 I'm not sure that Splinter would approve of Raph's less than ninja-esque habits. 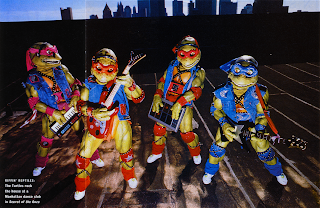 Here's a look at the photo that was used in TMNT II: The Secret of the Ooze for the newspaper at the end of the movie that declares: Ninja Rap Is Born! Actually, if you compare it to a screen shot from the movie, this photo is slightly different, so it was most likely taken right before or after the photo that was actually used. 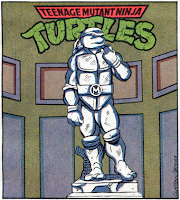 This is Michaelangelo as Michelangelo's David as drawn by Dan Berger for the January 27, 1991 TMNT newspaper comic strip. 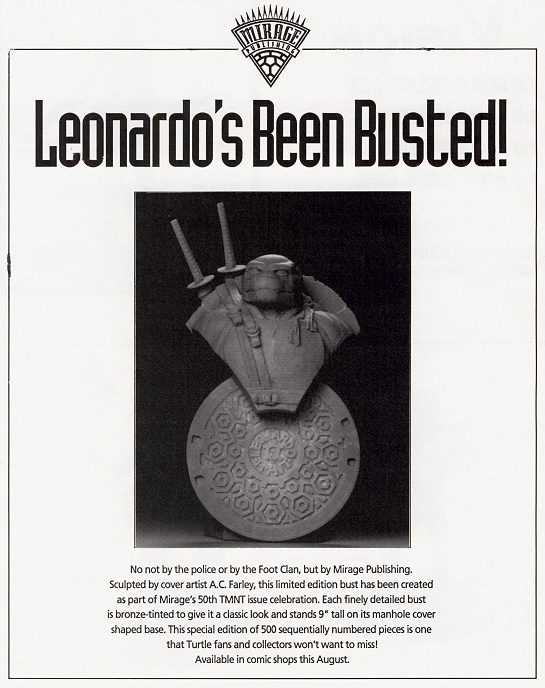 In 1992, Mirage Studios released this Leonardo bust sculpted by artist A.C. Farley. 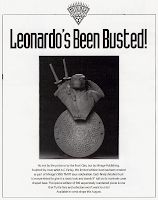 Pictured above are both a print ad for the bust and the bust itself. This is the bronze-brushed version; there is also a plain white version that you can paint yourself if you're so inclined (and have the talent). There are also sword scabbards that glue onto the back. The box says that it was an edition of 500, but I've read that there were production issues and that the actual number shipped was less than that.